No occupation is without risk and dentistry is no exception. In today's ultramodern era, safety and protection are everybody's concern and are of paramount importance. The saying “Prevention is better than cure” is universally true. Until the 1980s, dentists performed dental procedures with little knowledge about personal protection. The ever-increasing knowledge about personal protection and cross-infection control has changed this perception. While the use of protective gloves and mouth masks by all the dentists appear to be the norm at present, this may not be true for eye protection. Routinely performed dental procedures include the removal of caries, tooth removal, oral prophylaxis, and restoration of teeth, which are accomplished by the use of power-driven instruments rotating at a speed of 80,000-5,00,000 rpm. During the performance of these procedures, there exists a possibility of particles projecting out and causing injury, which may be physical, chemical, or microbiological. These projectiles include pieces of the enamel, calculus, amalgam, pumice, etc. Dental turbine-created aerosols can act as a serious threat of infection as they contain an array of infectious microorganisms, viruses, and fungi, which can transmit infections to the respiratory tract and to the unprotected eye. Ocular injuries include mild irritation of the eye to serious consequences leading to loss of vision. To avoid such untoward consequences, the Occupational Safety and Health Administration (OSHA), American National Standard Institute (ANSI), Centers for Disease Control and Prevention (CDC), and British Dental Association (BDA) have made mandatory guidelines and have put forth the recommendation of personal protective equipment. The American Dental Association (ADA) in 2003 has published the “Guidelines for Infection Control in Dental Health-Care Settings 2003,” which states: “Protective eyewear with solid side shields or a face should be worn by dental health care personnel during procedures”. The use of protective clothing including eyewear is also advised by the Control of Substances Hazardous to Health (COSSH) Regulations, 2002 and Personal Protective Equipment (PPE) requirements at Workplace Regulations, 1992. The routine use of goggles or spectacles with side pieces and plastic lenses conforming to British Standard BS2092 are recommended. The failure to update and implement these recommendations can lead to an increase in the incidence of such injuries. 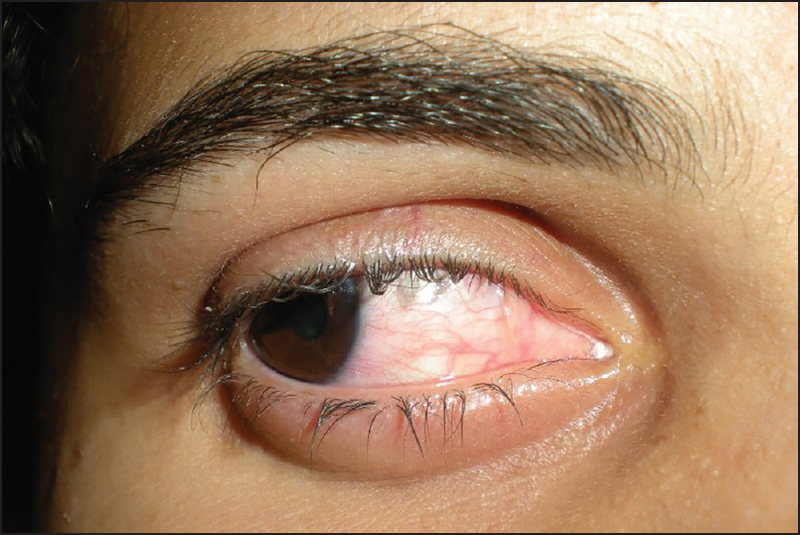 This case report describes such a situation of eye injury in a Bachelor of Dental Surgery (BDS) undergraduate student resulting in corneal ulceration and episcleritis, caused by dislodgement of calculus of a while performing manual scaling procedure on a patient. During manual scaling procedure on a patient, an undergraduate female student got injured in her right eye as a result of dislodgement of the calculus. Immediately she was instructed to rinse her eye with clean water a number of times. Despite repeated rinsing, as the irritation continued to persist, she was advised to consult an ophthalmologist immediately. By then, the eye had turned red with difficulty in opening [Figure 1]. Upon consultation, the ophthalmologist performed a slit lamp examination and diagnosed it to be episcleritis with corneal abscess/ulceration and advised her to get corneal scrapping done. After corneal scrapping she was advised antibiotics and anti-inflammatory (cefixime 200 mg, Aceclofenac), along with eyedrops (Vigamox, tobramycin, and natamycin 5% every hour) homatropine 2%, (twice daily) and an eye ointment to be applied for every 1 h. Sunglasses were given to protect her eyes during daytime and whenever she moved out. After 3 days, when the irritation persisted, corneal scraping was performed for a second time with a staining procedure to rule out viral infection. The student was advised to continue the same medication for the next few days. After 10 days, the redness and irritation had reduced but only to return. This time, the ulceration appeared to be more prominent [Figure 2]. Steroids were added to the existing medication. Complete recovery occurred after 1 month [Figure 3]. The patient was advised to taper the dose of medication and stop. This injury had restrained her from carrying out her routine activities for 1 month. It took 3 months for the complete recovery. Accidents can occur anywhere and at any time. The dental office can be a source of ocular injury due to mechanical, chemical, microbiological, and electromagnetic insults. Both the dental personnel and the patient are at risk, which is mainly attributed to the use of power-driven handpieces and ultrasonics. Manual scaling involves the removal of plaque and calculus from supra- and subgingival areas of teeth by the use of certain instruments. Effective instrumentation is based on the concepts of grasp, finger rest, adaptation, angulation, and use of strokes. It is during the application of scaling stroke that the calculus got dislodged and injured the eye of the clinical student. In most cases, the particle locates itself in the conjunctival sac or cornea causing acute pain, irritation, and reddening of the eyeball. However, deeper penetration may lead to perforation of the cornea and injury to the lens. Since the eye is a vital structure, simple contact with an infected substance (e.g., aerosol) has the potential to cause infection without the need to be breached. Herpetic keratitis is said to be one of the worst infections that can be contracted by clinical dental staff. Various studies have reported the adverse effects of eye injuries owing to lack of utilization of eye protection. In a study conducted by Ramos MF, eye injuries accounted for 6% of all national injuries with 60% of those injured professing to not having worn any eye protection. The adverse effects include corneal abrasion, hemorrhage, conjunctivitis, keratitis (bacterial or viral), hepatitis, and human immunodeficiency virus (HIV). In another study conducted by Al Wazzan AK, the prevalence of ocular injury and infection among the dental personnel, the dentist and the technician, had a prevalence of 42.3% of foreign bodies in their eye during the period of 1 month. The author concluded that protection of the eye should be emphasized and it should be protected at the undergraduate level. The awareness of the eye protection should be highlighted at all clinical and research symposia. Another survey by Stokes AN showed that eye protection for the dental personnel and patients did not meet the currently recommended standards. Sims et al. reported that 43% of the orthodontists reported instances of ocular injury during debonding and trimming acrylic. Farrier et al. reported that 87% of general dental practitioners (GDPs) wore eye protection that was not adequate. Out of them, 48% had experienced ocular trauma or infection and 75% of these resulted from not wearing eye protection. Palenik CJ has stressed on the awareness of eye protection to assure a safe working environment. A survey by Lonnroth EC and Shahnavaz H on adverse health reactions on the skin, eye, and respiratory tract among dental personnel showed a significantly higher prevalence of conjunctivitis and atopic dermatitis. In another study, Folk JC and Lobes LA reported bacterial endophthalmitis and traumatic hyphema that resulted from injuries during dental procedures. According to a study by Ajayi YO, Ajayi EO, significant difference in the prevalence of ocular injury among the dental personnel were reported with the technologists having the highest prevalence of 40% and dental students with lowest prevalence of 15.4%. ADA and Occupational Safety and Health Administration (OSHO) has outlined that dental staff should wear either a face shield or shatter resistant glasses with side shields while performing the procedures that could result in projectiles, chemicals, and aerosols entering the eye. The presence of an eye wash station within 7.62 meters of all the employees has also been emphasized so that immediate care can be given. Hence, protection of the eyes becomes an integral part of any procedure. As the dental team holds value in function and protection of teeth, the same value should be applied to the eyes. Protection of the eyes should be emphasized at the undergraduate level and its awareness should be highlighted at all clinical and research symposia. “Healthy vision for health teeth” should be the motto. All dental personnel must be educated about eye safety in the dental office. This should be instructed to the students enrolled in dental profession once they are exposed to the use of rotary or ultrasonic instruments. To the author's best knowledge, this is the first kind of case reporting eye injury with dislodged calculus, affecting a clinical student while performing manual scaling procedure. Accidents do occur but their frequency can be minimized by the implementation of certain set standard guidelines. Visual health is a vital component of general health. Specific guidelines have been recommended by OSHA, ADA, and BDA. The failure to implement these guidelines can lead to serious outcomes. These injuries can be prevented with the use of common sense, proper education, adequate eye protective eyewear, and correct handling of dental instruments and materials. The authors certify that they have obtained all appropriate patient consent forms. In the form the patient(s) has/have given his/her/their consent for his/her/ their images and other clinical information to be reported in the journal. The patients understand that their names and initials will not be published and due efforts will be made to conceal their identity, but anonymity cannot be guaranteed. Farrier SL, Farrier JN, Gilmour ASM. Eye safety in operative dentistry-A study in general dental practice. Br Dent J 2006;200:218-23. Jolanta Szymanska. Work –related vision hazard in the dental office. Ann Agric Environ Med 2000; 7:1-4. Edward E. Hill. Eye safety practices in U.S Dental school restorative clinics, 2006. J Dent Edu 2006;70:1294-7. Al Wazzan KA, Almas K, AL Qahtani MQ, Al Shethri and Khan N. Prevalence of ocular injuries, conjunctivitis and use of eye protection among dental personnel in Riyadh, Saudi Arabia. Int Dent J 2001;51:89-94. Ramos MF. Prevention of work related injuries: a look at eye protection use and suggested prevention strategies. J Ophthalimic Nurs Technol 1999;18:117-9. Albdour MQ, Othman EF. Eye safety in dentistry-A study. Pak Oral Dent J 2010;30:8-13. Stokes AN, Burton JF, Beale RR. Eye protection in dental practice.NZ Dent J 1990;86:14-5. Sims AP, Roberts-Harry TJ, Roberts-Harry DP. The incidence and prevention of ocular injuries in orthodontic practice. Br J Orthod 1993;20 339-43. Palenik CJ. Eye protection in dental laboratories. J Dent Technol 1997;14:22-6. Lonnroth EC, Shahnavaz H. Adverse health reactions in skin, eyes and respiratory tract among dental personnel in Sweden. Swed Dent J 1998;2233-45. Folk JC, Lobes LA. Bacterial endophthalmitis and traumatic hyphema resulting from ocular injuries during dental procedures. Can J Ophalamitis and traumatic hyphema resulting from ocular injuries during dental procedures. Ajayi YO, Ajayi EO. Prevalence of ocular injury and the use of protective eye wear among the dental personnel in a teaching hospital. Nig Q J Hosp Med 2008;18:83-6.